After a successful crowdsourcing campaign, the Save Homeworld project doesn't win the Homeworld rights, but pushes forward anyways. When THQ exploded, its various properties were flung across the heavens for mighty publishers to pluck down for themselves. While popular IPs like Warhammer 40k and Saints Row found safe homes, the fate of many properties remain uncertain. Among the cast-offs is the classic space RTS Homeworld. It's been years since Homeworld 2 and its fans think that it's more than time for a sequel. That was the goal of teamPixel, the group behind Save Homeworld. They used Kickstarter and IndieGoGo to raise the funds in order to purchase the rights to the franchise and develop the sequel themselves. Despite meeting their goals, the project was outbid by another company (which remains unnamed). Even so, they're not letting that stop them. 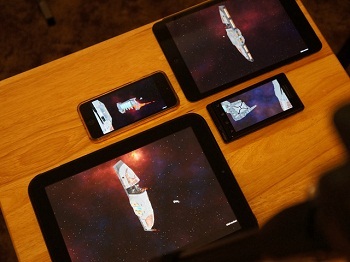 Homeworld or no, teamPixel is pushing on with their game, undeterred. Their initial plans called for the development of two games: Homeworld 3 and Homeworld Touch. While the former would be a full desktop experience for PC, Mac, and Linux programmed in Unity, the later would be translated for an iOS/Android environment. As cool as a Homeworld return would be, a Homeworld with a touch interface would be more awesome frosting on the cupcake. The new owners of the Homeworld rights should be announced within a couple of weeks. Meanwhile teamPixel is refunding all the donations they received, so donors should check their Kickstarter/IndieGoGo/Paypal accounts for details. Interested parties should keep an eye on teamPixel as more details roll out as they retool the game for the new IP. As thanks for the support, all backers of Homeworld 3 will be credited in the upcoming game.